We are visiting the D-Day landing beaches and battlefields from the June 6, 1944 invasion. We flew to Brussels (cheap flights at the time) and rented a car, then drove across Belgium and France to Sainte-Mère-Église. We arrived there late in the afternoon and easily found a place to stay, as we were visiting in September. It's the off-season, things are still open but there aren't many visitors. Sainte-Mère-Église was our base for visiting Utah Beach and Omaha Beach and other nearby sites. We continued visiting sites toward the east, along the British and Canadian landing beaches of Gold, Juno, and Sword, and inland toward the city of Caen. It meant for full days, but there are excellent highways south from Sainte-Mère-Église and then an east-west freeway making it easy to keep our base in Sainte-Mère-Église and do all this as day trips. It was September, the tourist crowds of the summer and especially June weren't there, so some places in the smaller town of Sainte-Mère-Église closed earlier. But a pizza place stayed open until around 8 PM, and after that there were a couple of tabacs where we could at least get a sandwich if we weren't getting back until 9 or 10 PM. While the U.S. 82nd and 101st Airborne divisions were landing along the west flank, and the Free French paratroopers operating with the British Special Air Service were landing in Brittany to prevent reinforcement from German forces there, British and Canadian airborne infantry parachuted and landed gliders in this eastern flank area. This eastern airborne operation was designated Operation Tonga. The area east of the landing beaches was an open flat plain between the Orne River and the Dives River. The terrain plus the transportation infrastructure would allow counterattacks all along the landing zones by German armored forces, unless the river crossings could be captured or destroyed. Ideally captured and held, so they could be used by the Allied forces to break out of the landing zones and advance inland. In the days following the landing operations of the 6th, enormous temporary harbors were constructed from prefabricated units towed across the Channel and assembled into artificial ports. Vast quantities of material and men were moved ashore through these temporary harbors over the following months. But before any work could start on assembling these harbors, and even before the landings could begin in earnest, nearby large German gun emplacements overlooking the coast had to be silenced. 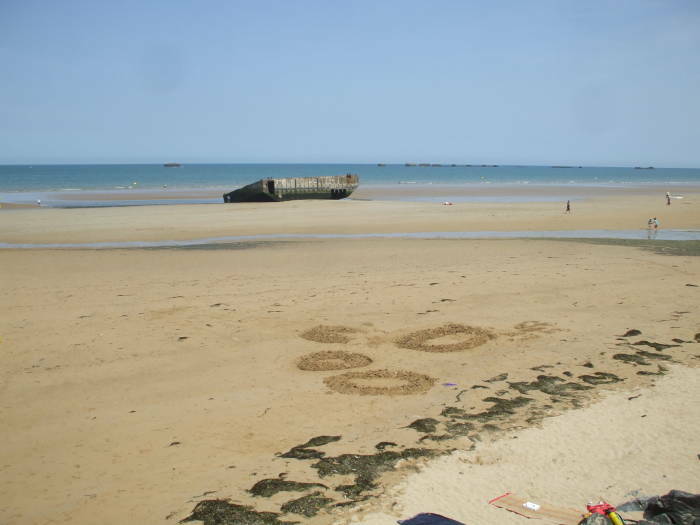 Arromanches-les-Bains is on the coast northwest of Bayeux, marked on the map below. 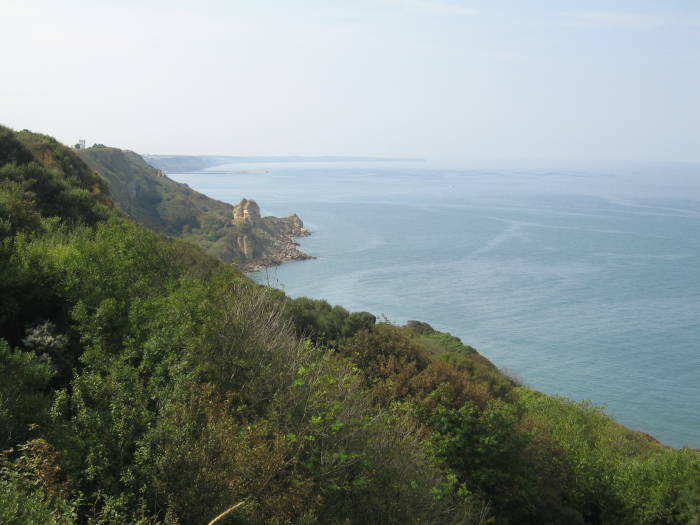 Longues-sur-Mer is just to its west, on the cliffs north of Manvieux. 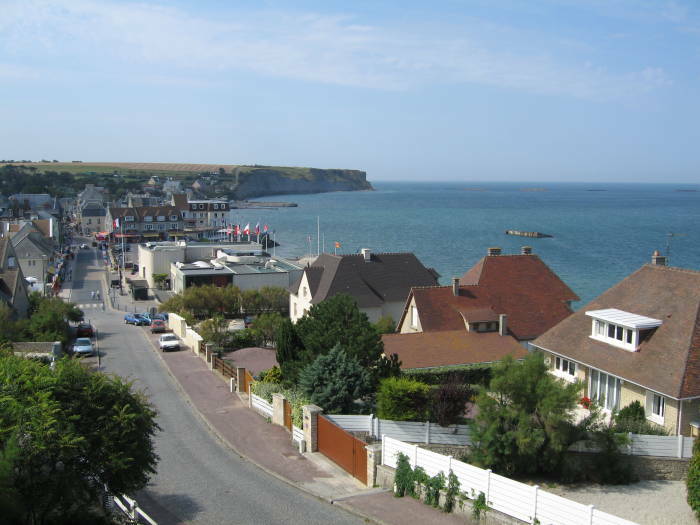 Arromanches-les-Bains, or simply Arromanches, is northeast of Bayeux and on Gold Beach. It was the site of one of the "Mulberry" artificial harbors, eventually known as Port Winston, and the one of the two Mulberry harbors used the longest. It was assembled and in operation by 9 June, just the third day after the landing started. While it was only designed for three months of operation, it remained in operation for ten months, eight of those months seeing very heavy use. 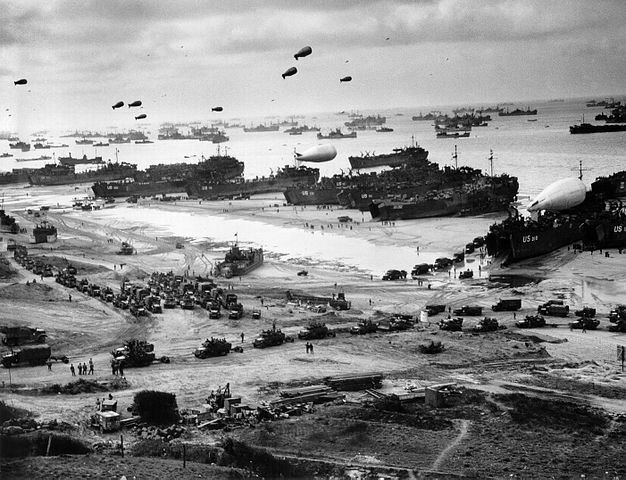 2,500,000 men, 500,000 vehicles, and 4,000,000 tons of supplies were landed at Port Winston. 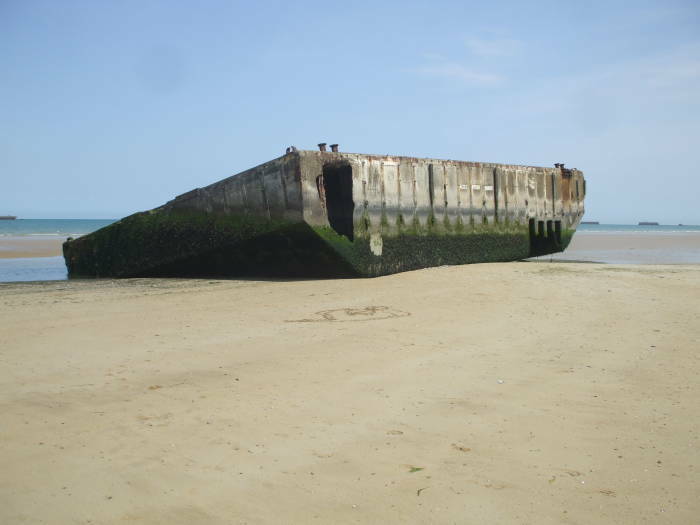 The Normandy coast has large tides, critical factors in the planning and timing of Operation Overlord. In the following pictures you see the harbor near both high tide and low tide. The Mulberry harbor components are visible in both. These large tidal variations also influenced the design and use of the artificial harbors. The bay and harbor at Arromanches near high tide. 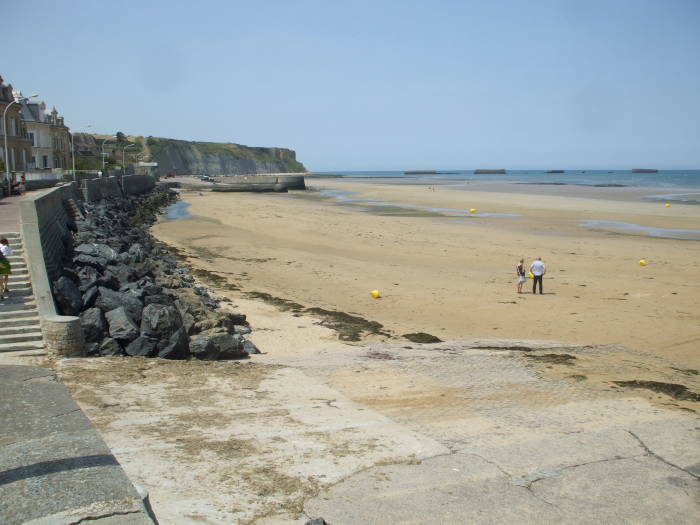 The bay and harbor at Arromanches at low tide. Some equipment was unloaded directly from landing ships onto the beach, as seen in this U.S. military photo of Omaha Beach. While a large amount of equipment, material and men could be landed this way, even large cargo throughput would be possible with something more like the piers of a conventional harbor. 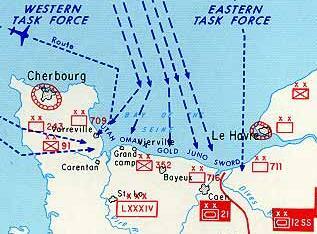 The Allies would not capture a large port such as Cherbourg or Le Havre until much later. They had planned all along to construct a portable harbor and bring it across the Channel. 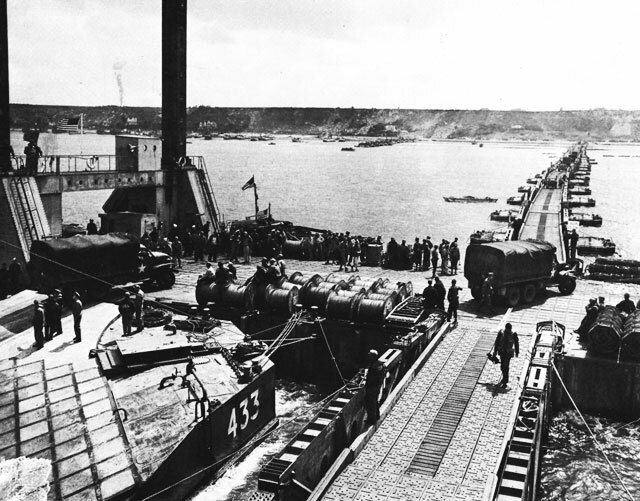 Offloading equipment directly from landing ships onto Omaha Beach. U.S. military photo. 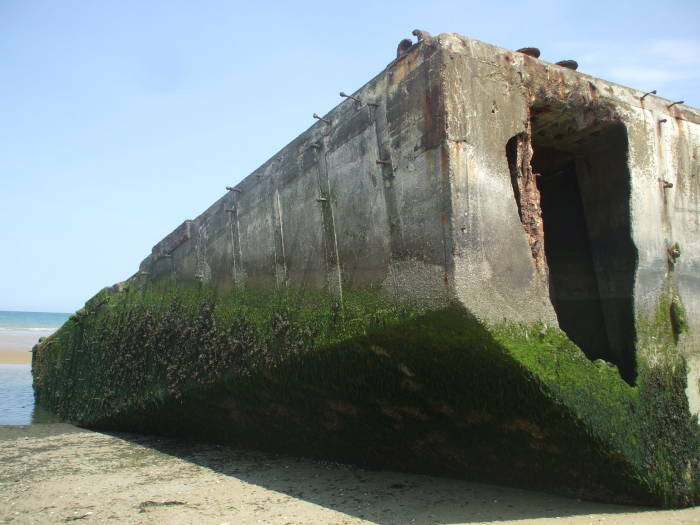 The "Mulberry A" artificial harbor was built at Omaha Beach, but it was not securely anchored and was destroyed in storms in late June after just a few weeks of operation. 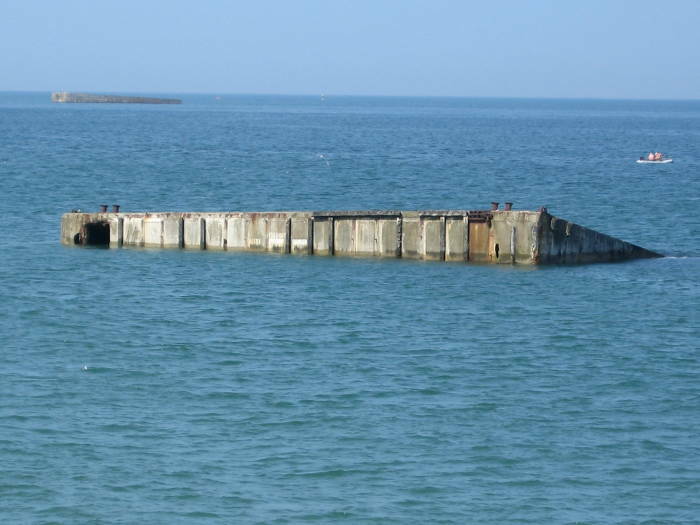 The large "Mulberry B" harbor at Arromanches had been in operation since June 9th. 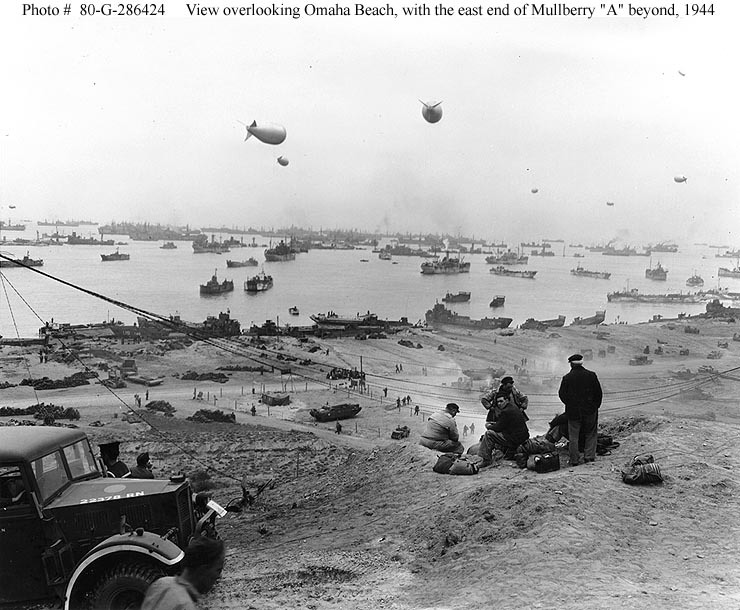 The plan had been for the Americans to use Mulberry A and the British and Canadians to use Mulberry B, but all Allied forces used Mulberry B.
Omaha Beach and Mulberry "A". U.S. military photo. The artificial harbors were built from several components described by an unusual nomenclature. The outermost components were the floating outer breakwaters, called the Bombardons. There was then a static inner breakwater. Some of these were constructed from Corn Cobs, ships which were scuttled after crossing the Channel under tow or under their own power. They also used Phoenixes, reinforced concrete caissons. An assembly of Corn Cobs and Phoenixes and the sheltered water they enclosed was called a Gooseberry. Floating piers called Whales were made from reinforced concrete. These were bridging units with 80-foot spans mounted on steel or concrete pontoons called Beetles. The Beetles were held in place by cables running to Kite anchors. Other pier anchors were Spuds. Some of these Whales were later used to repair bridges in France, Belgium, and Holland and a few are still in service, including on along the D517 road near Vierville-sur-Mer. Floating roadway supported by pontoons joined the piers to the shore. Unloading trucks from ships onto an artificial harbor and driving the floating jetty to the beach. U.S. military photo. The resulting system was a harbor similar to that of Dover, one of Britain's major ports. Large ships could tie up in an environment similar to how they were normally used: sheltered water with adequate draft next to a pier on which cranes and trucks operated. The Mulberries were prefabricated in large sections in Britain. 600,000 tons of concrete were needed to build one harbor, producing 33 jetties with 15 kilometers of floating roadway for trucks to transport men and materiel onto shore and inland. These pictures show the variation in tide. That tidal variation combined with the shallow slope of the beach means that the water line moves in and out a great distance along much of the Normandy coast. Two Mulberry artificial harbor components at high tide. That same Mulberry artificial harbor component near low tide. Mulberry artificial harbor component near low tide. Developing Beaches and Reconstruction Ports, chapter 16 of The Corps of Engineers: The War Against Germany. MULBERRY "B" D+4—D+147, prepared by G-4, SHAEF. Miracle Harbor, at the Navy Department Library. Longues-sur-Mer is a small village near the edge of the very high bluffs just west of Arromanches. The high of the bluffs there make it a poor place for a landing, it was between the American Omaha Beach and the British Gold Beach. But that height makes it an excellent place for artillery and gun control observation posts, and that is what the Germans had placed there. 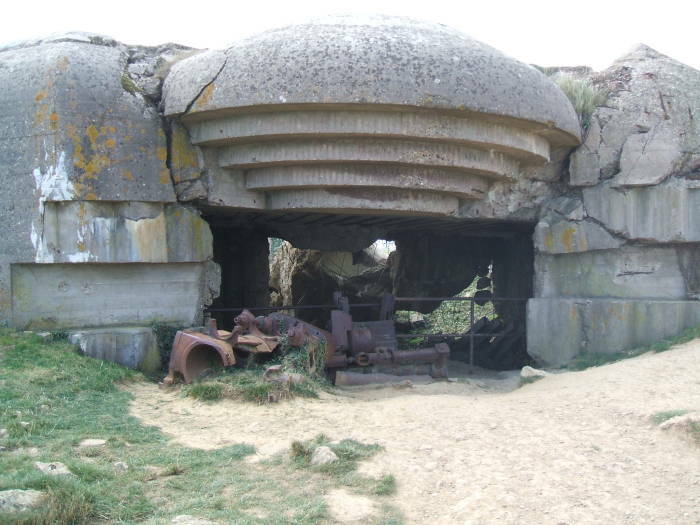 There were four 150 mm naval guns in large reinforced concrete casemates, a fortified observation bunker near the edge of the bluff, plus command and logistical fortifications. 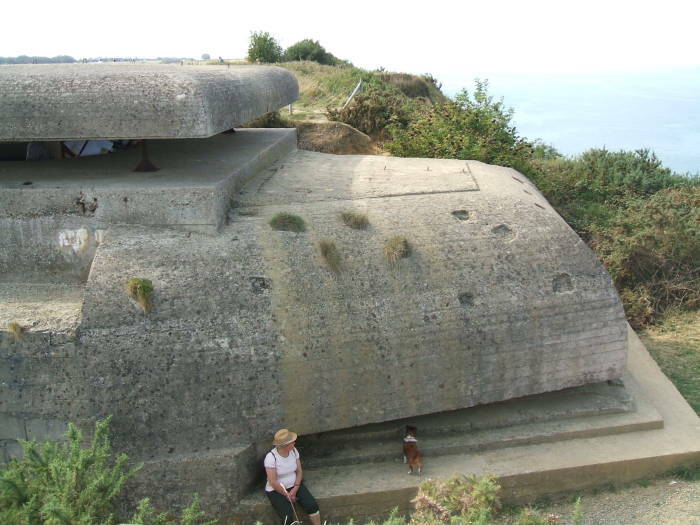 The gun casemates and control bunkers were built from steel-reinforced concrete two meters thick. The guns, naval 150mm TK C/36 guns built at the captured Škoda works in Plzeň, had a range of almost 20,000 meters. 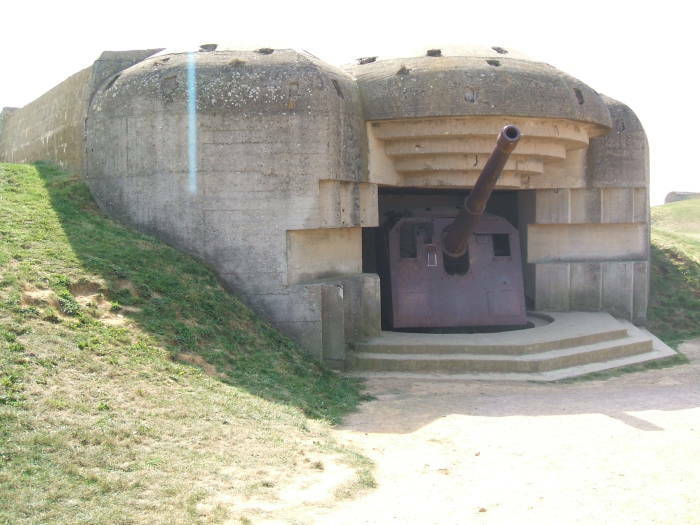 This meant that the Longues-sur-Mer battery threatened both Gold and Omaha Beaches and their approaches. There were also 20mm anti-aircraft guns and various small bunkers and guns for protection from land attack. Clifftop German battery overlooking Arromanches, near Longues-sur-Mer. 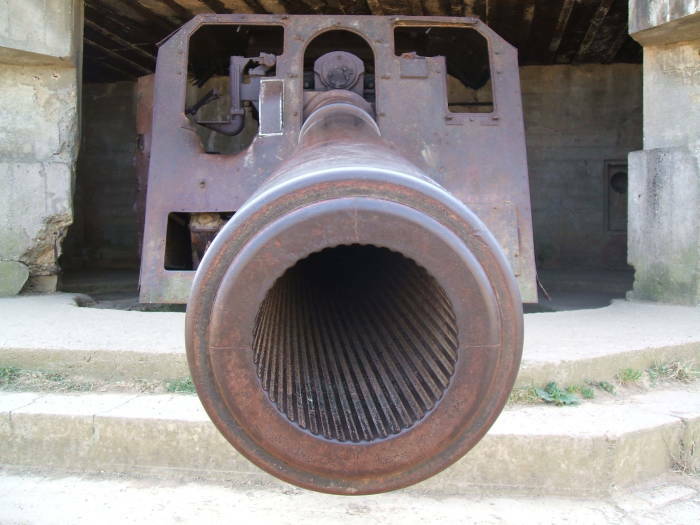 Muzzle of 150 mm gun. Allied bombing missions dropped a lot of ordnance on the site overnight on 5/6 June, and then the French cruiser Georges Leygues and the U.S. battleship Arkansas opened fire on it with their heavy guns at 0537. The air raids had not reduced the capabilities of the guns, but they had largely destroyed the underground cables connecting the control bunker to the gun casemates. This meant that the guns had to be controlled by visual signalling, much less effective especially when under continuing naval artillery barrage. 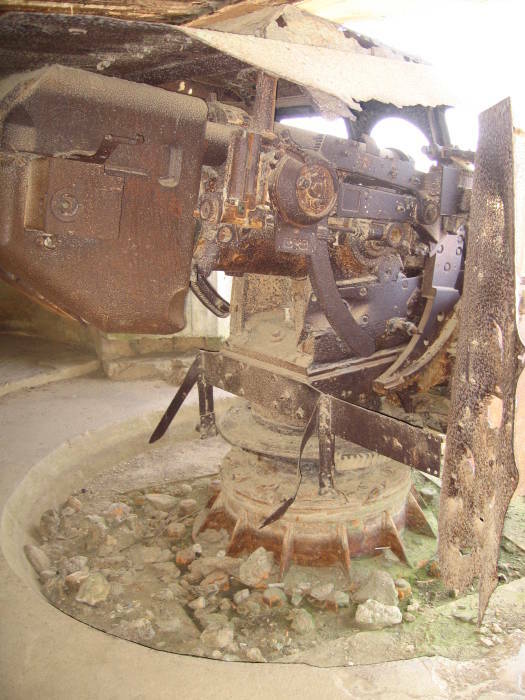 Breech and damaged controls of 150 mm gun. The German battery opened fire at 0605, 25 minutes before H-Hour. The British cruisers Ajax and Argonaut disabled three of the four guns, although the remaining one operated intermittently until that evening. The British 231st Infantry Brigade captured the site on the 7th. The view east toward Arromanches, which is just beyond that row of Mulberry harbor components. The observation post at Longues-sur-Mer looks down on the bay at Arromanches, and from that high vantage point you can see more of the surviving Mulberry harbor components. Omaha Beach is visible in the other direction. 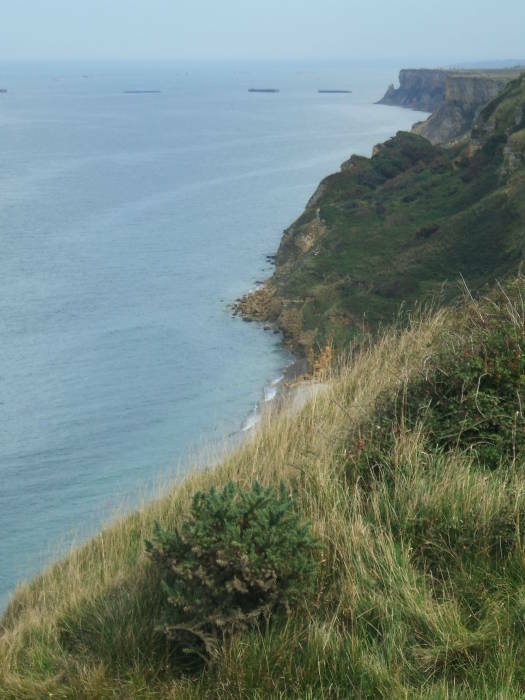 The observation bunker is at the edge of the cliffs. The gun casemates are about 300 meters further back. Observation bunker with two horizontal viewing slits. The view west toward Omaha Beach. 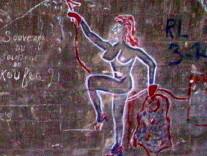 Some German military graffiti has been been preserved, where the Germans had cast decorative patterns into the surface of some of their fortifications. I couldn't help noticing that the theme differed significantly from the American graffiti found in the concrete hanger at Écausseville. I think that the French had also noticed and appreciated the difference, and maybe that's why they preserved both. After several days in Normandy it was time to move toward Belgium. East from Sainte-Mère-Église one last time, through Bayeux and its commemoration of the Norman Invasion of Britain in 1066. Along the way we saw a few things from long before 1944 or 1066. 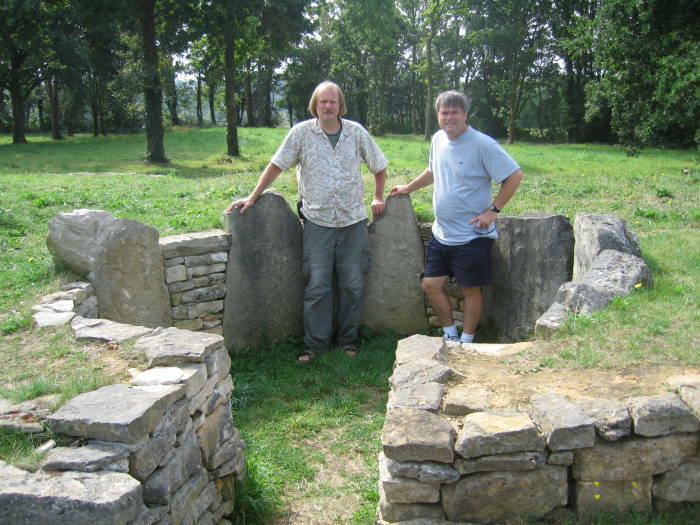 France has a lot of megalithic structures surviving from the Neolithic and Chalcolithic eras, 4500-1500 BC. 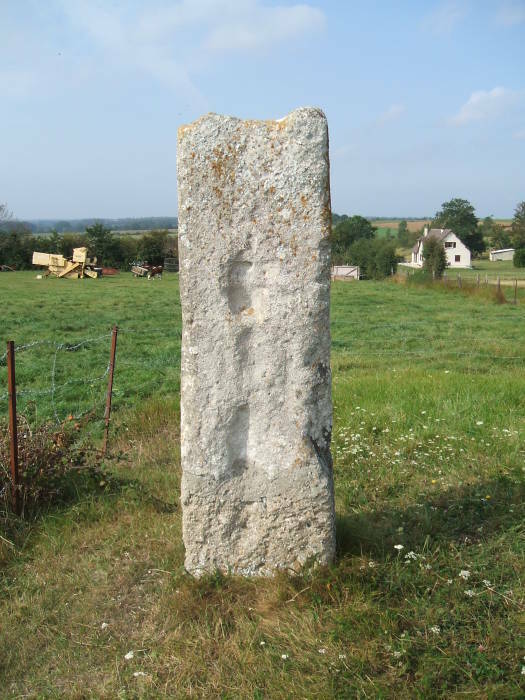 This one is a simple menhir or single standing stone, just outside the village of Colombiers-sur-Seulles along the D12/D176/D35 road from Bayeux to Douvres-la-Délivrande. Tim points at a megalith as the cows say meuh. 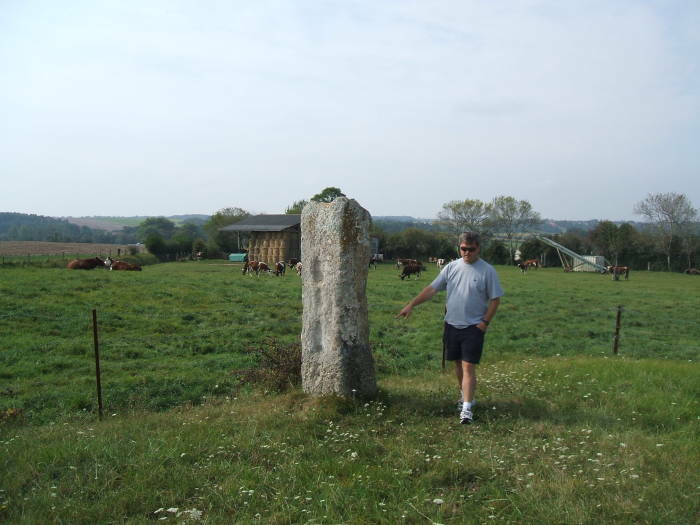 Just a little further east, near Reviers, is a small roadside park around remains of larger megalithic structures. There is the lower stone section of a dwelling, similar in some ways but smaller and simpler than those at the settlement of Skara Brae in the Orkney Islands. 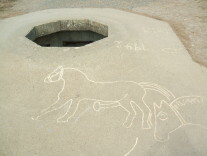 There is also a passage grave. This is a burial chamber lined with stones, accessed through a narrow passage with a low ceiling. Some passage graves were in the form of dolmens, with a single large stone slab, quite literally a megalith, forming its roof. Others had corbelled roofs forming shallow domes. The stone structure would have been covered with an earthen mound. Many passage tombs were built so the rising or setting sun shings into the passage at a significant point in the year, such as the winter solstice. Passage graves are found throughout the Atlantic coastal lands of Europe where the megalithic culture spread. Some are as far south as the northern coast of Africa, others in Ireland and throughout Britain, and on the Orkney Islands off Britain's northern coast. 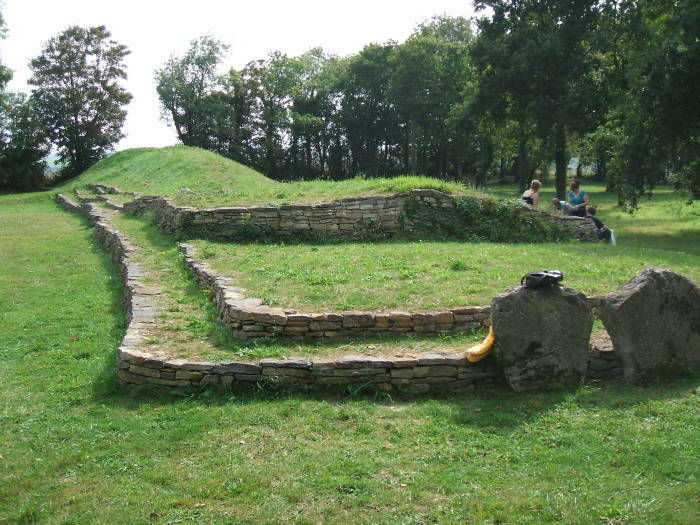 Megalithic era passage grave near Reviers. We happened to stop there while a local group was preparing for "Megalithic Weekend", when sites throughout France host special displays. I have pages with other megalithic travel ideas if you're interested in really old things. 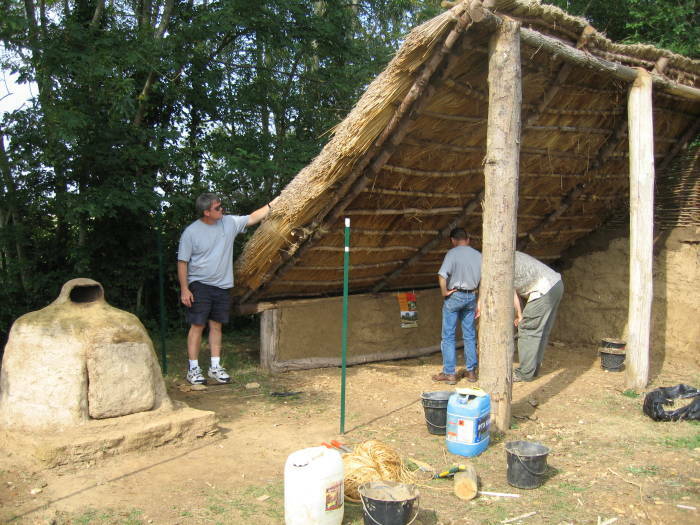 Tim inspects the reconstruction of a megalithic era shelter. 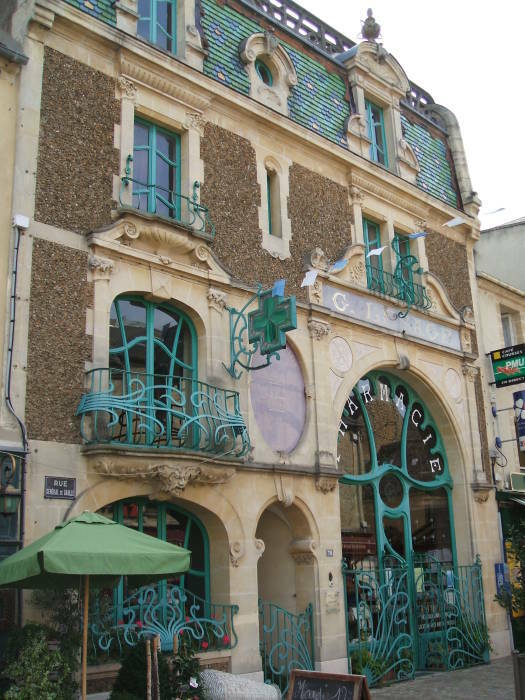 Art Nouveau architecture in Douvres-la-Délivrande. We continued to Douvres-la-Délivrande and got lunch, then continued on toward Pegasus Bridge. We visited a small British cemetery near Douvres-la-Délivrande. 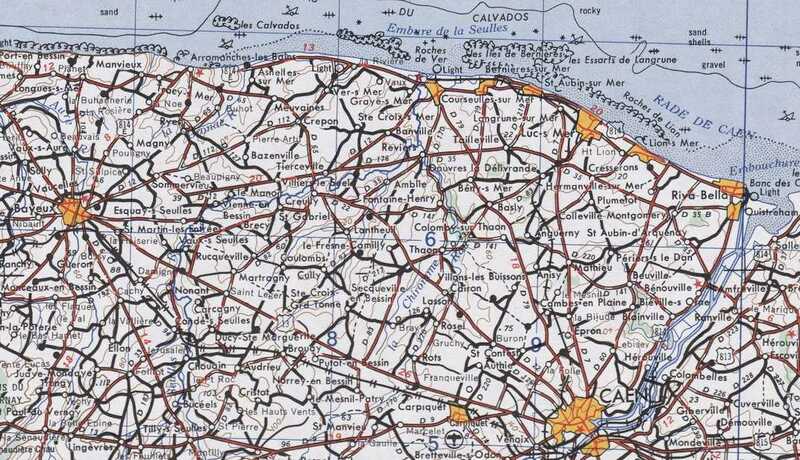 The Allied cemeteries are clearly indicated on the Michelin 1:150,000 maps and also on the finer-scale IGN maps. 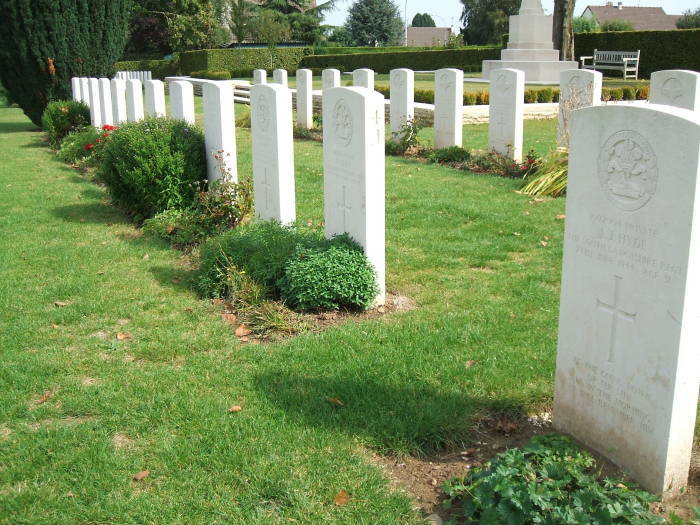 The British grave stones are of uniform shape, but the design and inscription on each is unique. The families have also planted various flowering plants and small shrubs around each stone, and local committees proudly maintain the graves. American military cemeteries are large, orderly, military. The British ones are a little more like small pockets of Britain, pieces of British village cemeteries.